DEVECSER, HUNGARY. 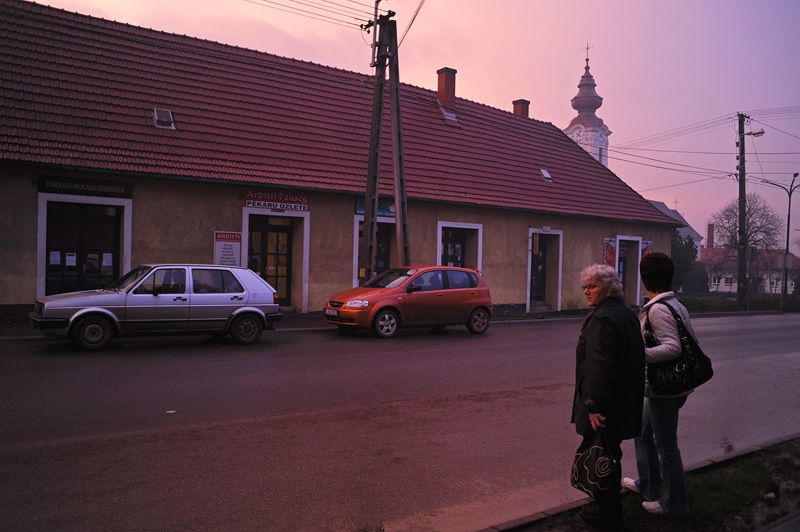 Iren Istvanne Nemeth, 71, with her daughter, Erzebet Nemeth, 50, on the main street after purchasing sleeping pills at the pharmacy on November 22, 2010, a few days after being released from the hospital and the same day she began to move into the homeless shelter established by the church, "New Beginnings"; Istvanne Nemeth lost her son, Istvan, 52, and was left homeless in the wake of an industrial accident at the MAL plant in nearby Ajka, Hungary on October 4, 2010, and has been staying with her daughter, Erzsebet, since then but says her daughter's extreme medical difficulties mean the solution must be a temporary one. Istvanne Nemeth said nightmares about the accident and losing her son made sleep impossible.